"Ratchet & Clank is a 2016 American-Canadian 3D computer-animated science fiction action comedy film based on the newest installment in the series of the platforming video game series of the same name. The film stars the voices of James Arnold Taylor, David Kaye, Paul Giamatti, John Goodman, Bella Thorne, Rosario Dawson, and Sylvester Stallone. Series creators Insomniac Games helped with the film's production, screenplay, character development and animation. The film was directed by Jericca Cleland and Kevin Munroe, featuring an original story written by Munroe, Gerry Swallow and former Insomniac Games Senior Writer T.J. Fixman, who started writing for the series with the Future saga. Several cast members from the games reprised their respective voice roles, and assets from the video games were utilized in the film. The film was released on April 29, 2016, by Gramercy Pictures. The film received negative reviews from critics and became a box office bomb." "Above planet Tenemule in the Solana Galaxy, Chairman Drek (Paul Giamatti) stands poised with his fellow Blarg aboard the Deplanetizer, a space station with the power to destroy entire planets. The Blarg fire the Deplanetizer at Tenemule, completely destroying it. In a warbot factory on planet Quartu, a diminutive yet intelligent defective robot is created. Having acquired Drek's plans, he escapes Drek's lieutenant Victor Von Ion (Sylvester Stallone) and attempts to travel to planet Kerwan to warn the Rangers. The defect crash-lands on Veldin, where Ratchet takes him in and names him Clank (David Kaye). Learning of Drek's plot, Ratchet flies Clank to Kerwan, where the two save the cornered Rangers from Drek's warbots and become instant celebrities, much to Qwark's jealousy. Under pressure from reporters, Qwark makes Ratchet and Clank honorary Rangers. 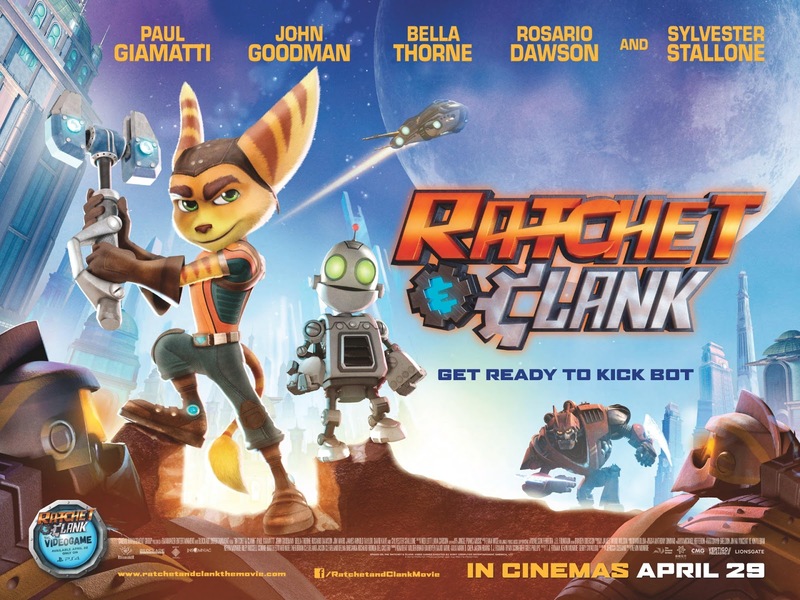 Ratchet joins Brax Lectrus (Vincent Tong) and Cora Veralux (Bella Thorne) in the field while Clank is assigned to the Rangers' support team with Elaris (Rosario Dawson), who is routinely ignored by Qwark. Studying the destroyed planets, they discover that the Blarg have been extracting portions containing famous landmarks from each. After briefing, the Rangers infiltrate the warbot factory on Quartu. They discover that the Blarg are planning to build a replacement planet from the other worlds' fragments as their planet Quartu having been polluted beyond surface habitation. The next target is Cora's homeworld of Novalis. Qwark encounters Drek, who offers to help boost his image in spite of Ratchet's popularity. Qwark accepts so long as Drek agrees never to hurt his Rangers. As the Rangers assault the Deplanetizer, Drek forces Qwark to deactivate the Rangers' weapons. Ratchet manages to successfully board the station, but Drek captures him and the Rangers can only watch as Novalis is destroyed. Appalled, Qwark goes to confront Drek. However, he is also met by Drek's devious chief scientist Dr. Nefarious (Armin Shimerman) whom Qwark thought was killed during a prison escape. After he chides Qwark for selling out the Rangers, Dr. Nefarious betrays Drek by turning him into a sheep and ejecting him to New Quartu in an escape pod and takes control of the Deplanetizer for his own intentions. Ratchet exiles himself back to Veldin, guilt-ridden, but Clank and the Rangers find him and convince him to return. With Novalis gone, the Deplanetizer's next and last target is planet Umbris which has an unstable core that would annihilate the other planets in the entire solar system if it is destroyed. After a brief tussle aboard the Deplanetizer, Qwark realizes his error and apologizes to Ratchet and Clank for his betrayal. They confront Dr. Nefarious, who reveals that he was once a Ranger himself before he left due to Qwark's mistreatment. Dr. Nefarious successfully activates the Deplanetizer, but not before the other Rangers are able to move it off target from Umbris. The Deplanetizer instead fires on New Quartu, destroying the composite planet and killing Drek, still being a sheep who crash landed on it moments prior. Ratchet, Clank and Qwark barely escape as the now-vulnerable station falls toward Umbris. Having thwarted Drek and Dr. Nefarious, the other Rangers return to a hero's welcome on Kerwan, with Qwark shamelessly attempting to promote his apologetic autobiography about the crisis. Ratchet and Clank reunite on Veldin, with Ratchet promising that he will rejoin the Rangers when he is needed. In a mid-credits scene, Dr. Nefarious is found amongst the Deplanetizer's wreckage on Umbris, and forcibly converted by one of his drones into his iconic robot form. In the post-credits, the Plumber appears and scolds the audience that they have still not left the movie yet."